What Dr. Paul Thombs does every day isn’t always pretty. And what he has his patients do generally doesn’t amount to much fun. 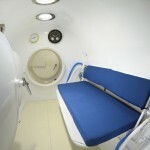 But when the hyperbaric medicine specialist’s head hits the pillow each night, he can sleep soundly, knowing that he provides a unique way of saving life and limb.